My hair is something that I have never been very adventurous with, I let it do its own thing most of the time. It is also naturally straight and very stubborn, meaning that trying to do anything to it is practically impossible. After a recent trip to the hairdressers, where she got a bit crazy with the scissors and put lots of layers in, it was time to do something with my hair. She put the layers in such a way that if I don't set it then it looks awful. I have had to find ways to styling my hair quickly and nicely. Recently, the only hair tools that I have been using along with my hairdryer are these two gems from Yogi*. 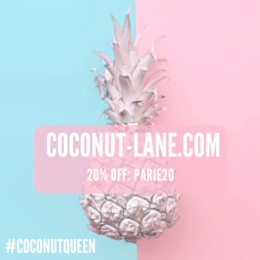 I came across the brand through social media and was very excited to hear when they wanted to work with me. 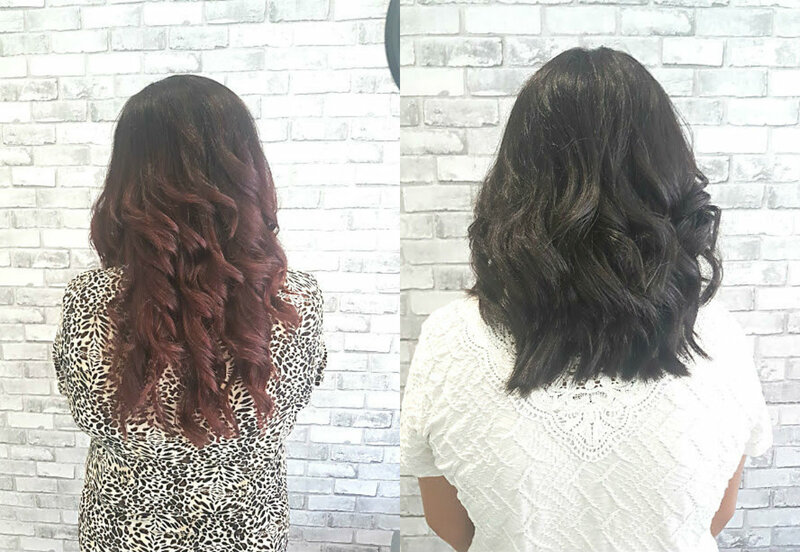 After putting the two products to the test, it is time to report back and tell you just how well they work on my hair which is thick, layered and straight as well as my mum's long, thick and curly hair. Of the two Yogi products that I have tried, the styler has been the best one to use in my hair. It is actually a 10 in 1 tool, making the perfect travel companion. It has tourmaline and ionic technology that helps to smooth the hair and keep it frizz free. It heats up from 120 to 200 degrees and is suitable for all hair types, whether you have short like me or long like my mum's. My go to way of using this is after letting my hair dry either naturally or with a hairdryer, taking the styler and adding soft waves to my hair. 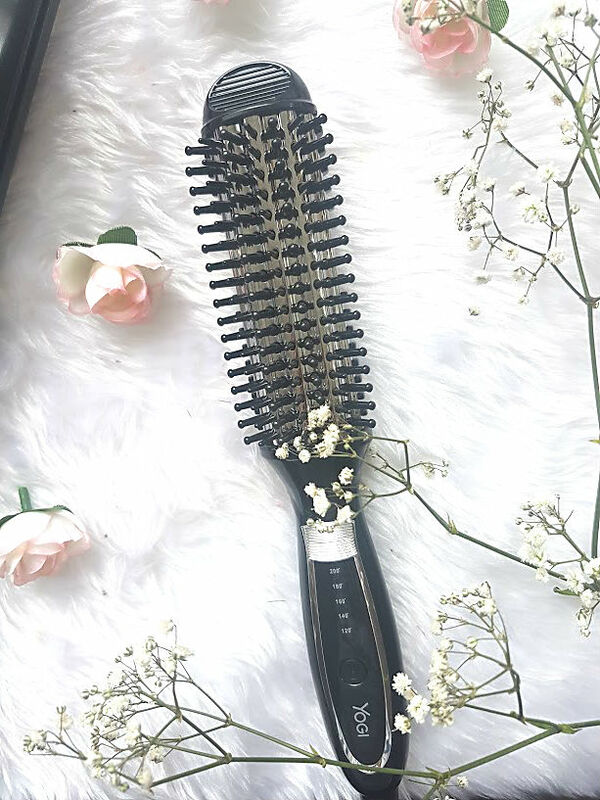 I use it as a brush first to add volume through my hair and it makes it so bouncy, then take it through the ends and wave it. I love how it makes my hair look and feel, shiny and full of volume. 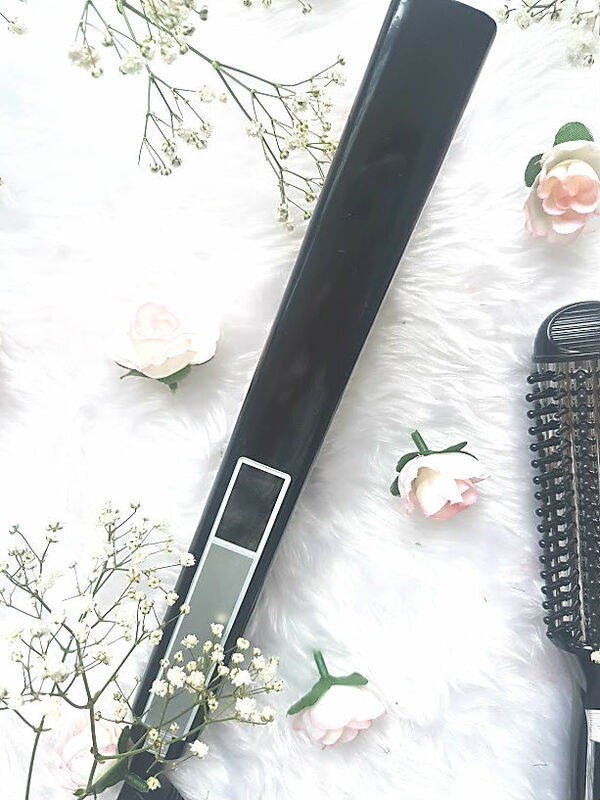 The styler is basically a hairbrush that heats up, making styling hair so much easier and quicker if you aren't someone that is good at hair. The price is also very reasonable as you are receiving one product that does so many different things. If there is a pair of straighteners that will give GHD's a run for their money it is these, I am in love with them. These straighteners are so powerful and very tech-y. A quick mention to the design before we talk about how well they work, the sleek black design screams to me as it is so simple and fuss free. 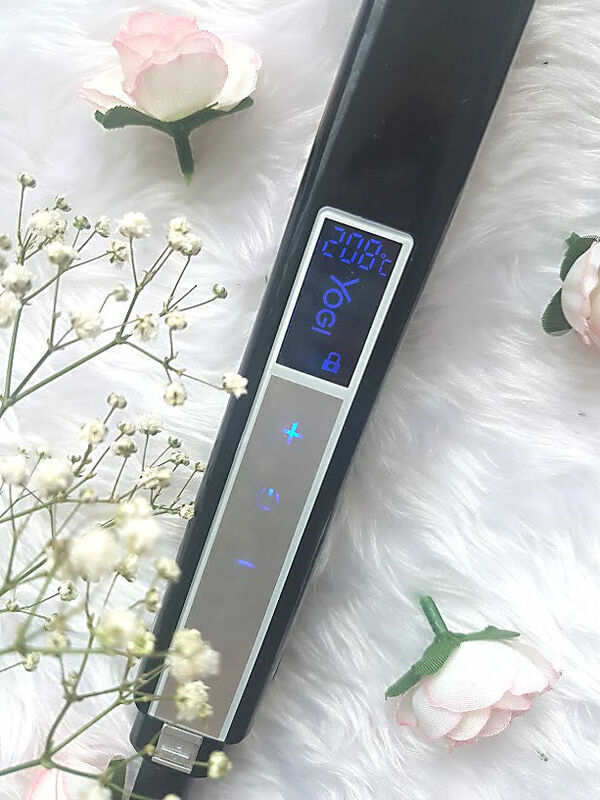 The interface of controlling the straightener is actually digital, you have a touch button to switch it on/off and adjust the temperature. I love that once you set it to the temperate you want, it locks. Meaning that the straighteners won't get cooler or switch off whilst you're using them. To unlock/switch off you swipe and this gets me excited every single time! As well as the incredible design the performance of these are also amazing. 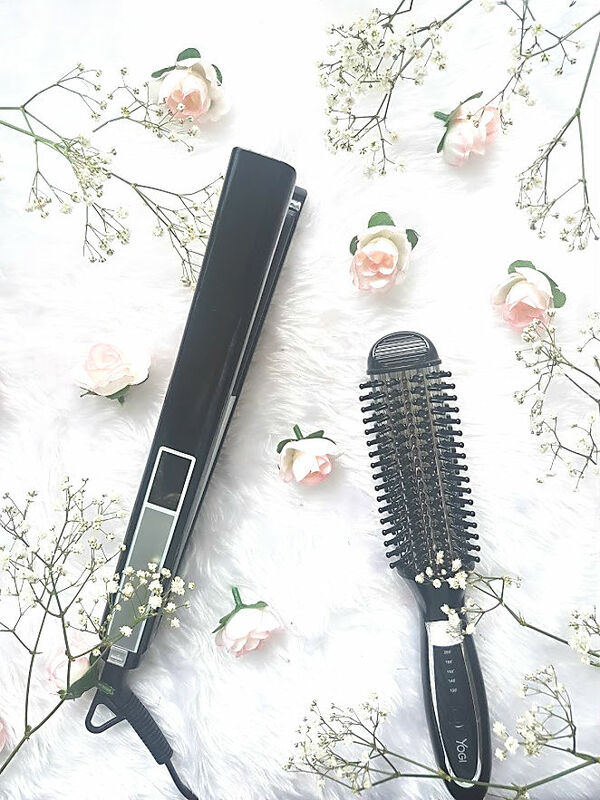 I love using it to straighten my hair, even though I haven't done this very much recently due to the connivance of waving it but it is also great to add curls to the hair. The thinner plate means you have better control over each section of hair and one twist reveals a gorgeous looking curl. As they are very powerful, you find that it takes very little time to curl or even straighten your entire head of hair. My mum has endless amounts and I found it a doddle to curl it all, pretty impressed with the turnout too! Both of these products are great for whatever hair type and style you have. If you are on the hunt for some new hair tools to inspire you then be sure to visit the Yogi website and their social media accounts, where you will want to invest in it all! What do you use to style you hair? Thank you Yogi for inspiring me and my mum for being a model!